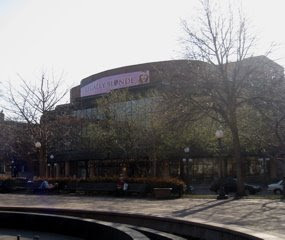 Our Minnesota residency under the auspices of Minnesota Public Radio brought us today to St. Paul, where suddenly it is summertime, and all we had to do was walk a few blocks to the lovely Ordway. In the afternoon Matt, Jace, and Eric were interviewed by Fred Child for Performance Today. 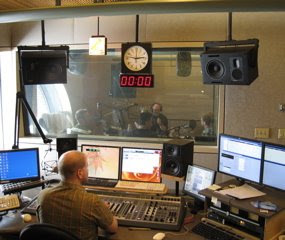 MPR also recorded the concert for broadcast. Performing in the Twin Cities is always a homecoming for us - there isn't a warmer or more appreciative audience in our universe. In addition to many longtime fans and supporters and colleagues, the composers come out! Minnesota seems to have more of them - and great ones!- than any other state we know of. 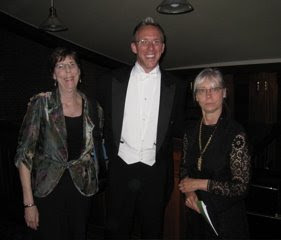 Here's Matt with Jan Gilbert ( whose compositions we've performed and recorded over the years,) on the left and Janika Vandervelde. Tonight we performed Janika's piece "All Things Resounding" which the Jerome Foundation commissioned for us last year. We also sang Shawn Crouch's "The Garden of Paradise" tonight and we were very happy that Shawn was here to hear it. We premiered it last month in San Francisco, and it's currently playing on Chanticleer Radio. 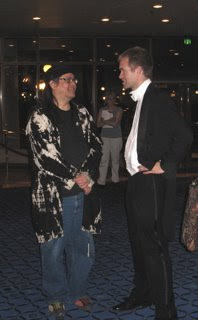 Another composer we've happily worked with over the years is Brent Michael Davids. We're currently touring his piece "Night Chant." You can just see Eric on the right in the scrum being photographed while several young women held on to his mustache. He seemed to be OK with this. Tomorrow we drive up to Moorhead for the final event in our Minnesota week.